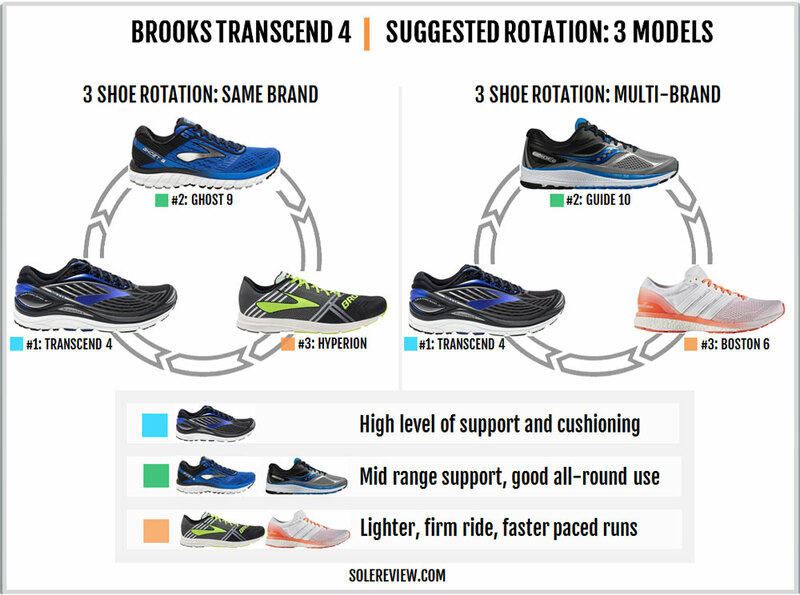 Brooks’ marketing pitch: The Transcend 4 provides an all-over approach to support that guides your whole body. 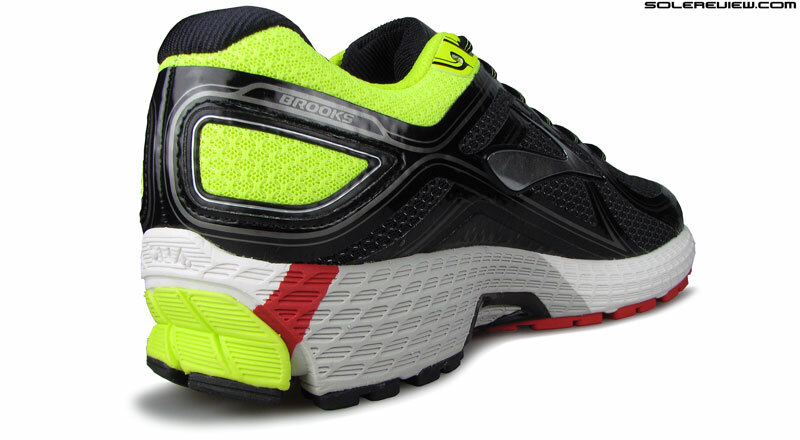 Upper: Mesh with high-density printing, fused synthetic, inner sleeve, Pebax external heel counter. Midsole: Dual-density foam, 8 mm heel to toe gradient. Outsole: Hard carbon rubber under the heel, softer blown rubber under the mid and forefoot. The Transcend 4 continues to blend cushioning and support in equal measure. Any changes? It is softer than the last year's model and retains the form-fitting upper. The shoe runs a bit short in sizing. Regardless of its quirkiness, we’ve always liked the Brooks Transcend – though some versions better than the others. It is a unique product in a sea of sameness, blending a cushioned ride with plenty of support. That’s something which not a lot of shoes manage to achieve. Also, the Transcend was the first of its kind to bring newness to the ‘support’ category by leaving out the hard midsole wedge. Other brands have followed suit, as evident in the adidas Ultra Boost ST, the Skechers GoRun Forza, and the soon-to-be-released adidas Supernova ST. The 2017 Transcend 4 is the fourth edition, and in our view, it is closest to the T1 in ride quality. The Transcend 2 turned a lot firmer than the original model due to the redesigned midsole and insole. The T3 evolved into a slightly softer version of the T2 but was still firmer than the T1. The Transcend 3 also introduced a redesigned ‘Guide Rail’ which was softer and gentler than the slightly invasive design of the T1 and T2. This year’s update includes a midsole which is softer than last year and an upper with cleaner aesthetics. It also drops $10 in retail price, going down from a stratospheric $170 to a still-exorbitant $160. Aesthetically speaking, the Transcend’s upper design has consistently gotten cleaner over the years. The first edition had a busy upper with synthetic overlays, internal lacing straps, and what-not; the T2 removed the overlays but kept the straps. And the last year’s Transcend 3 moved all the detailing beneath the outer mesh. 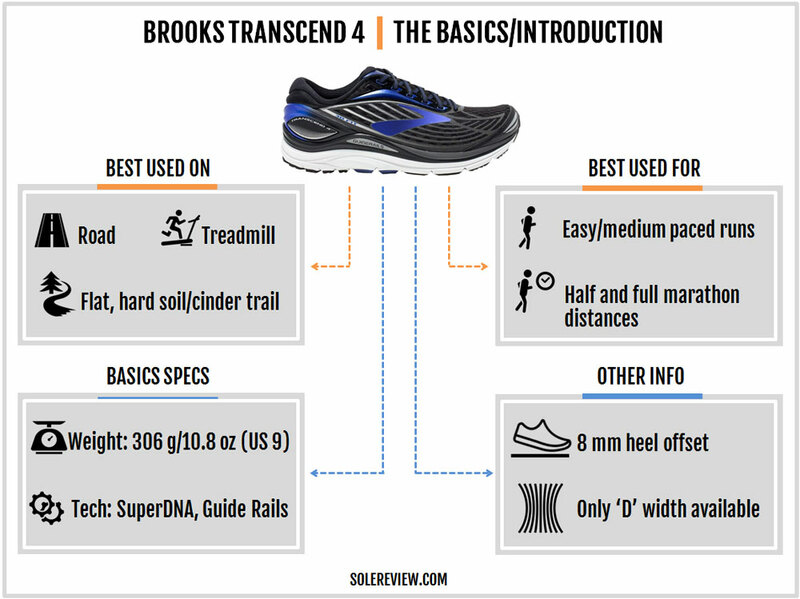 The Transcend 4’s upper is now more in line with other Brooks models such as the Glycerin. There are no fancy straps or laser-cut synthetic panels. Instead, the mesh upper has high-density printing like what we’ve seen in the past few iterations of the Glycerin. The mesh is softer than the T2 and T3, and for the first time, the front uses a stitched-on toe bumper with reflective trims on either side. However, the toe-bumper is longer on the both sides compared to the previous Transcends. 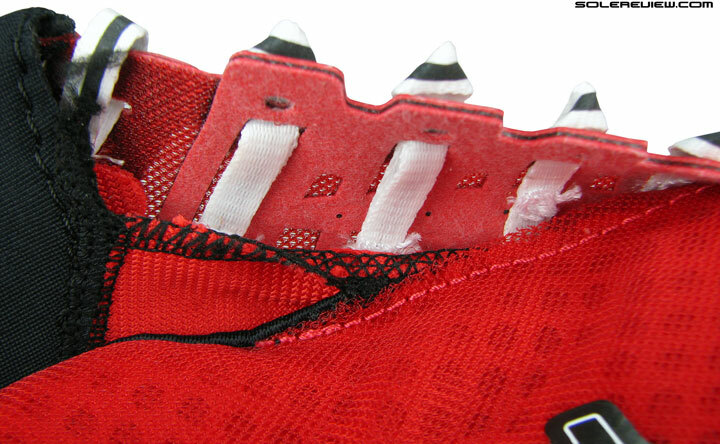 The lacing area is similar to the T3. The eyestay panel is made of a no-sew urethane strip with eyelet holes molded into them, and the laces are flat and stretchy – which is the same as the T3. The only difference is that first row of lacing rests directly over the upper instead of a molded panel. All Transcend models so far have had an internal sleeve, and the T4 is no different. The tongue connects to a midfoot sleeve, making the interior smooth. The tongue design by itself isn’t very different from the Transcend 3 except for the mesh change. There’s a piece of molded synthetic over the flap, same as last year. There are two important updates made to the heel area. The first concerns the increase in the collar foam padding. There’s more foam packed behind the soft lining, a change which affects the length-wise sizing of the Transcend 4. The external heel counter has been reworked too, though most of the difference is merely cosmetic. Both sides of the heel counter have open windows exposing a molded synthetic, and the edges extend on either side to blend in with the midsole Guide Rails. The small reflective trim placed below the T3’s heel counter isn’t there anymore. The Transcend 4’s midsole is a dual-density type. There’s a slab of primary midsole foam, and its upper edges are topped off with a firmer rim which forms the supportive Guide Rails. We must underscore the fact that the firmer rim is limited to only the periphery of the midsole, and does not insulate the SuperDNA foam midsole from the foot. 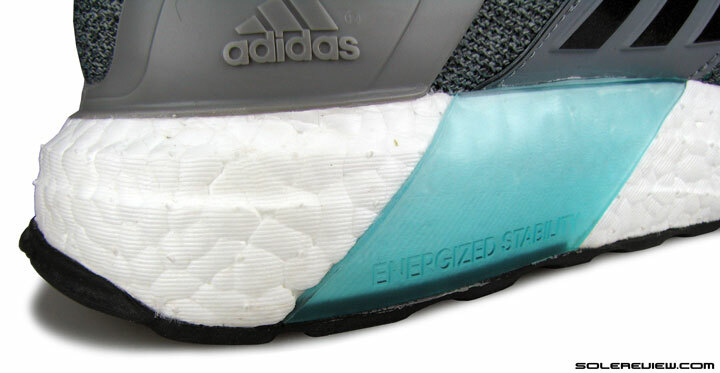 All that separates the foot from the midsole is the soft molded insole and the foam lasting below. One of the reasons why the Transcend 2 and 3 felt firmer than the V1 was the swapping of the SuperDNA foam insole with a BioMogo foam one. While both varieties are made of a soft foam, the original insole just felt smoother and better. 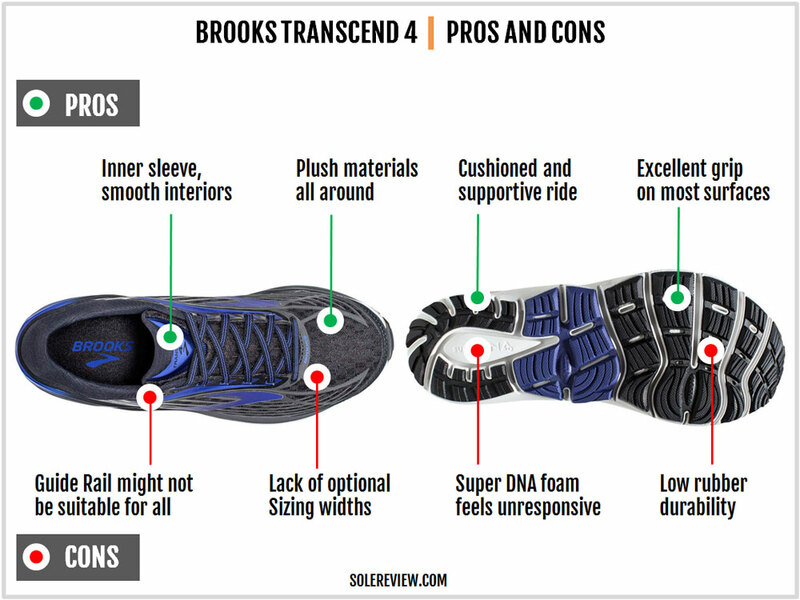 While the Transcend 4 does not have a SuperDNA insole, the midsole foam has been softened when compared to the T3. This is the change which affects the Transcend 4’s ride the most, bringing it closer to the T1 in the process. The ‘Guide Rail’ design is similar to the T3. It is co-molded with the foam midsole, and it swoops high on the midfoot sides. 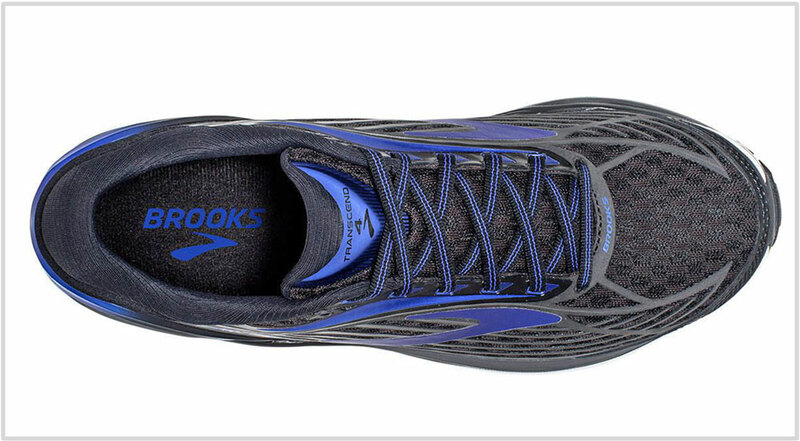 So take note if you like the feel of under-arch support; the Brooks Transcend 4 does it like no other shoe. One of the changes which we liked on the T3 were the redesigned Guide rails. On the T1 and T2, the curve was placed too close to the rear and had the tendency to press into the foot over longer distances. The T3 moved the Guide Rail curve forward and also made the material softer which allowed the feature to perform more efficiently. The Transcend 4 carries over a similar design ethos, and the Guide Rails feel supportive without the invasiveness of the first two Transcend models. The outer Guide Rail has a reflective trim, just like how it was before. The Guide Rails work in conjunction with the external heel counter to cup the foot. The heel counter made of molded Pebax extends on both sides to blend with the Guide Rail curve, so there’s a sense of continuous support starting from the heel to the midfoot. 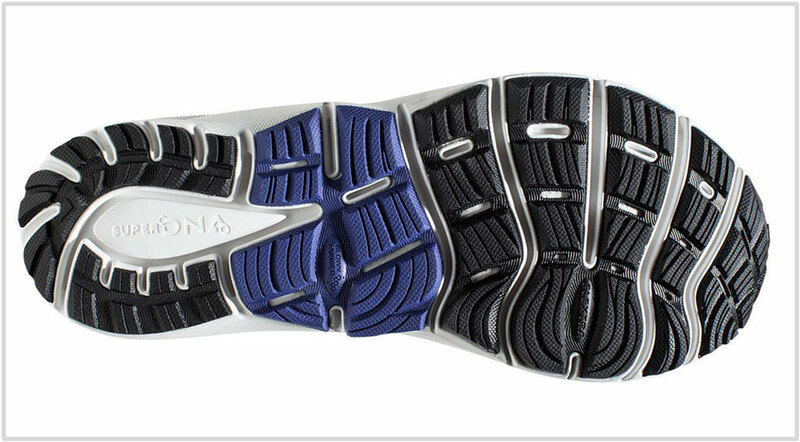 The outsole has the same blown rubber and hard rubber combination, albeit with a few updates. The softer blown rubber forefoot has an extra flex groove over the Transcend 3, making that section more flexible. The midfoot and rearfoot design is similar to the T3. The midfoot uses a broad blown rubber slab, and the rearfoot uses two pieces of harder Carbon rubber with generous grooving. The crash pad design is similar to the T3, and so is the exposed area of foam in a teardrop shape. One of the things which the Transcend does differently than most running shoes is its midfoot design execution. 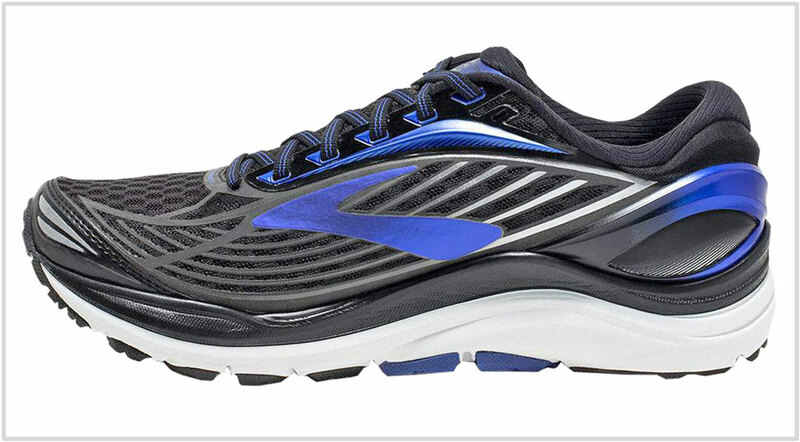 The waist is extremely wide, which when combined with the forefoot results in a superbly planted and supportive feel. The lack of outsole durability has been a constant Brooks gripe, and expect no different from the Transcend. 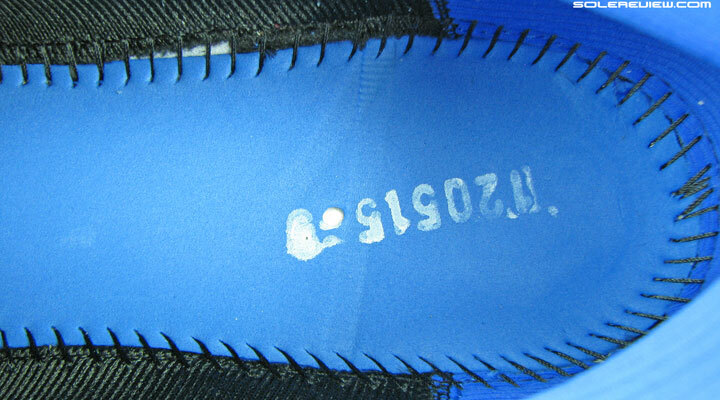 The soft outsole grips very well, but that comes at the cost of faster wear and tear. Compared to rubber compounds from other brands, most Brooks shoes will shred quicker. There are no issues with the upper or midsole, both of which have a robust build and unlikely to fail prematurely. Here’s the thing. The toe-box height has actually increased over the T2 due to the new stitched toe-cap, but it doesn’t feel that way. The updated heel padding and counter pushes the foot slightly forward and cancels the effect of the new bumper. So the Transcend 3 and 4 feel similar when it comes to the toe-box height. It is shallow, but not uncomfortably so. There’s an internal sleeve tethering the tongue to the sides, so the midfoot fit inspires confidence with its snug wrap. The heel provides an excellent level of hold; the abundance of foam padding and the external clip join forces to grip the ankles securely. 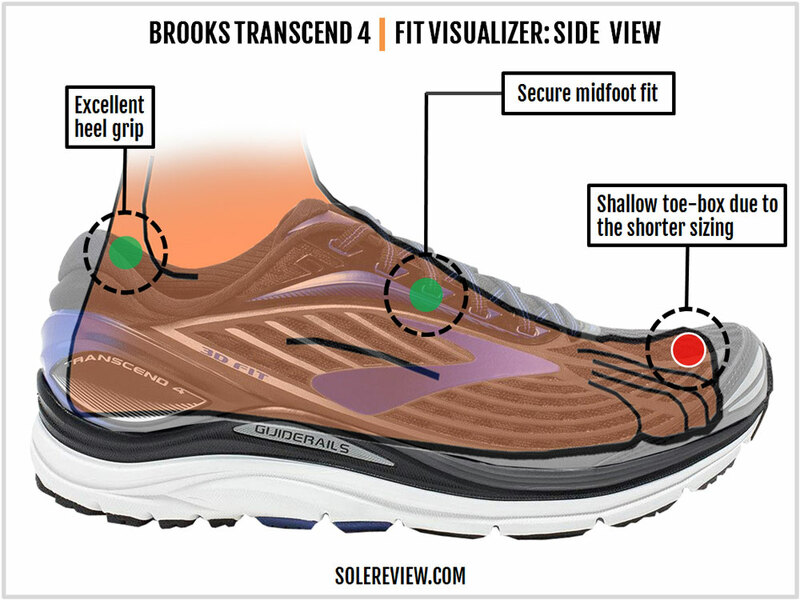 The Transcend 4 fits a bit shorter in size due to the heel pushing the foot forward. The sizing margin between the T3 and T4 isn’t large enough to justify a half-upsize, but if you’re coming from other brands, it will be prudent to buy a half size larger. 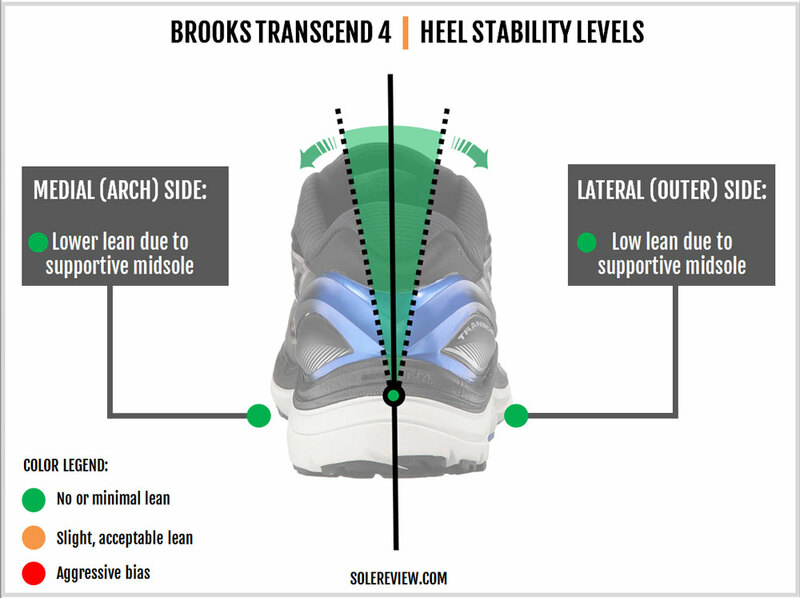 If it weren’t for the narrower heel, the Transcend 4 would have a wider forefoot and a taller toe-box than the T3. After all, the T4 ditches all that thick mesh layering for a simpler design with external printing. But as the wider part of the foot is pushed forward, the forefoot fit gets affected too. It is worth mentioning that the stitched toe-bumper is a bit longer than the welded one used on the Transcend 3, and this encroaches a bit into the forefoot fit. Do note that the Transcend does not come in additional widths, so if you don’t like the upper fit, then your options are uh, narrow. And why doesn’t the Transcend offer additional sizing widths? It has a lot to do with the ‘Guide Rail’ midsole design. As you know, when brands offer a 2E (wide) or 4E (Extra wide) version, they only change the upper fit and not the midsole. That works perfectly well with traditional midsole designs where the edges are flat and below the insole level. But on the Transcend, the midsole walls rise higher, so offering a wide upper without increasing the midsole base will lead to some very awkward runs. The foot will probably spill out, and the Guide Rails will apply uncomfortable pressure underneath. There’s plenty of cushioning on the Transcend 4, though not of a pillowy kind. 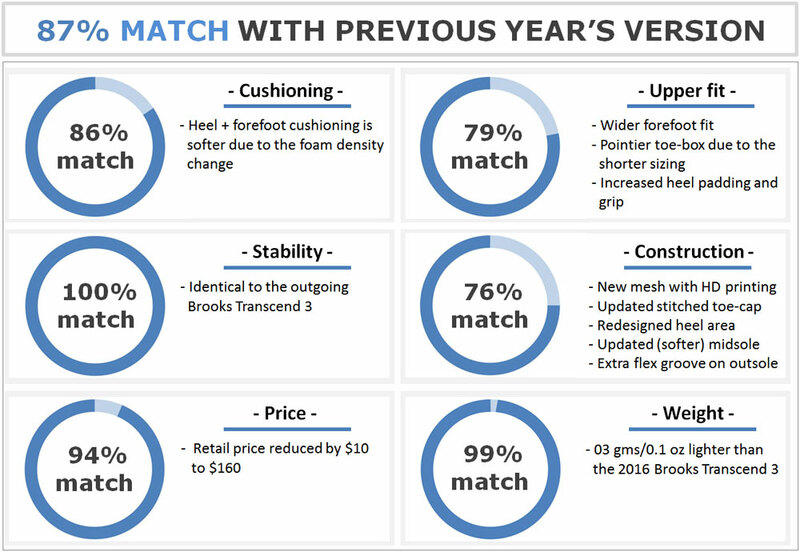 The softest layer of cushioning is provided by the removable insole; below that, the foam lasting and the midsole comes together as a thick stack of firm cushioning. A few other things help with the Transcend’s cushioning. The exposed area of foam below the heel results in a softer rearfoot feel, and the blown rubber used under the mid and forefoot also contributes to the overall cushioning quality. If the Transcend fits you well, then it’s great shoe for longer runs up to a marathon. There’s ample padding underneath to insulate you from the jarring effects of the running surface, and the reasonably lightweight build helps too. This is also a shoe which offers a balanced amount of cushioning for both rearfoot and forefoot strikers. Even if you landing on the front, the combination of various foam components along with the blown rubber delivers adequate cushioning. The New Balance Fresh Foam and Brooks DNA foam variants are two different materials of the same kind. Both deliver a well-cushioned experience, as any foam compound should, but lack any bounce or springy feedback. Nothing wrong with that, but this is good to know so that you can manage your expectations. 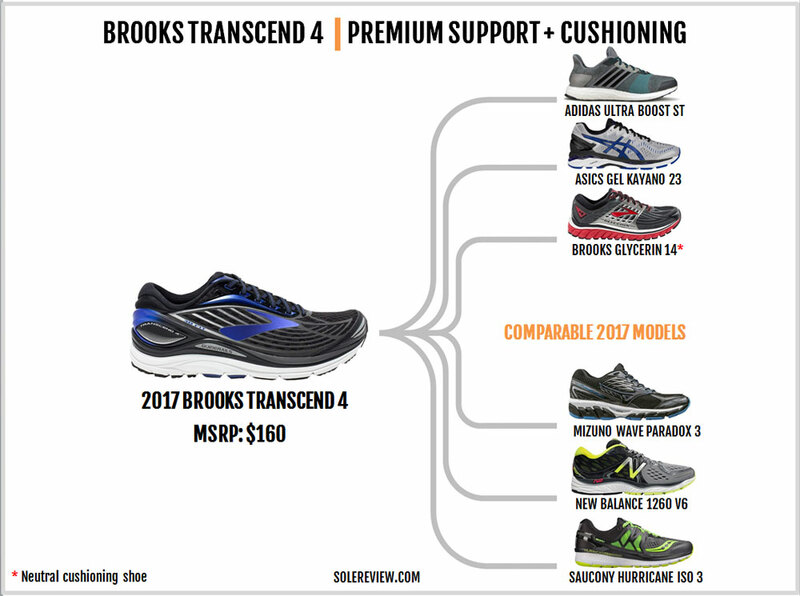 Brooks advertises the ‘all-over’ support quality of the Transcend 4, and none of that marketing spiel is an exaggeration. The shoe is truly supportive, a trait which is delivered without the lopsided feel of a medial post – simply because the Transcend doesn’t have it. The cushioned midsole is accented with firmness, and the outsole has a wide footprint. This produces a very planted feel regardless of where you land. The Guide Rails and the large heel counter are of immense help too, as they cup the sides of the foot. Progressions feel smooth on the Transcend. The lack of mushiness allows the foot to roll over the shoe without sinking, and the consistency of foam material below provides a connected ride experience. There’s plenty of grooving on the outsole too, which allows transitions to happen gradually during the gait cycle. 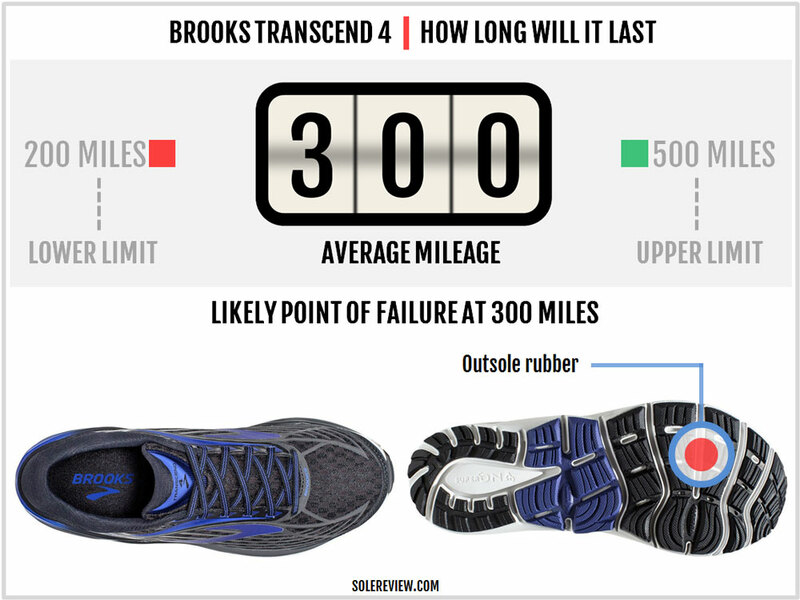 There’s a reason why the Transcend 4 made it to the list of running shoes for heavier runners. 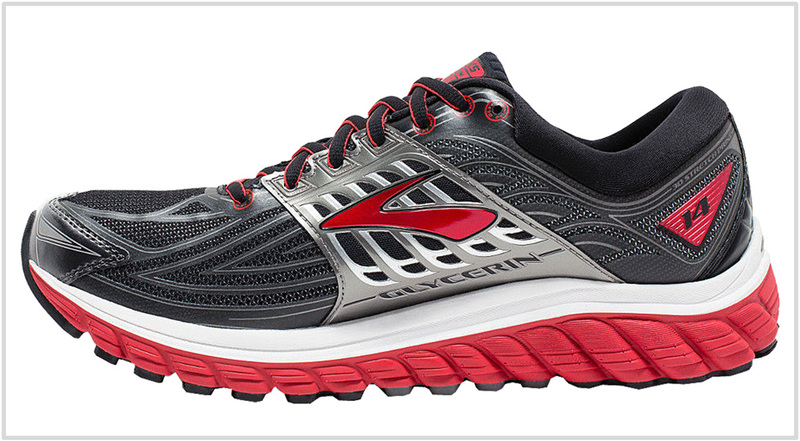 The cushioned yet supportive ride character is the Transcend 4’s greatest strength. This is an area where it lords over all other shoes, and the smooth ride is a bonus. Materials used to make the Transcend are premium in form and function, befitting its $160 retail price. The interiors are smooth because of the inner sleeve and no-sew construction. But make no mistake; while the $10 drop in price over last year is a welcome change, the Transcend 4 is still very expensive. 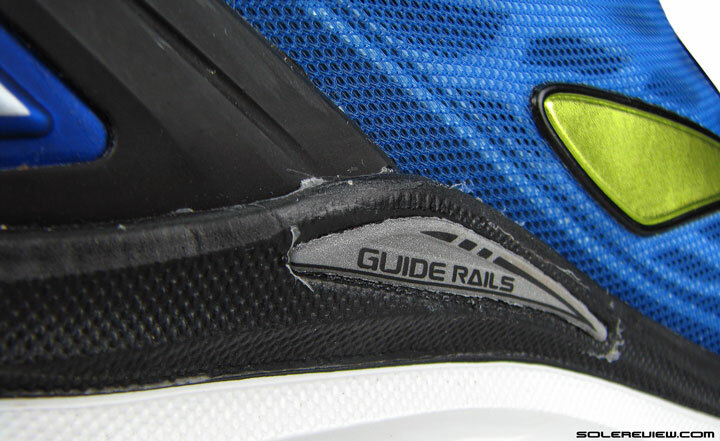 The Guide Rail design of the midsole works as it’s supposed to, but it might not be suited for all. The caveat to a happy Transcend 4 experience is that there needs to be a perfect harmony of the foot shape and the Transcend’s last. If your foot is too wide, then the Guide Rails might feel intrusive instead of being supportive, with poking sensation all-around. Getting this right is tricky; the Guide Rail midsole which feels perfectly ok during the initial fit trail or shorter runs might not work during longer runs. 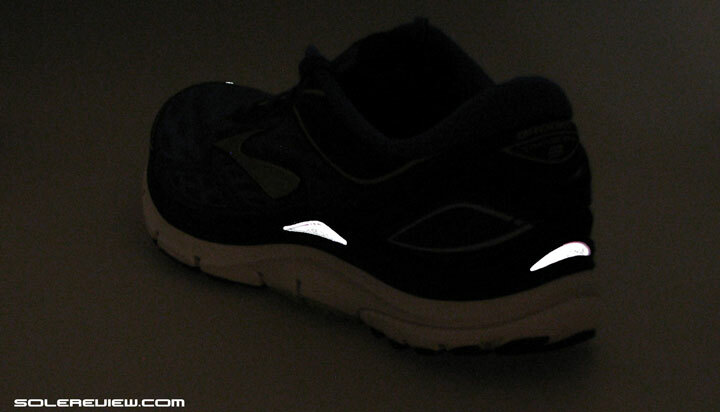 Some aspects only get noticed after continuously clocking 10 miles or more in the same shoe. And oh, there are no optional sizing widths available. You need to watch out for a couple of other things. The excellent outsole grip comes at the cost of long-term durability, and the sizing runs slightly shorter compared to other shoes and even the Transcend 3. The 2017 Transcend is a slightly softer than the past two editions. The midsole foam has been softened a bit which means the T4 is closer to the original T1. There are changes in the upper fit over the T3, though the increased heel padding cancels most of it. 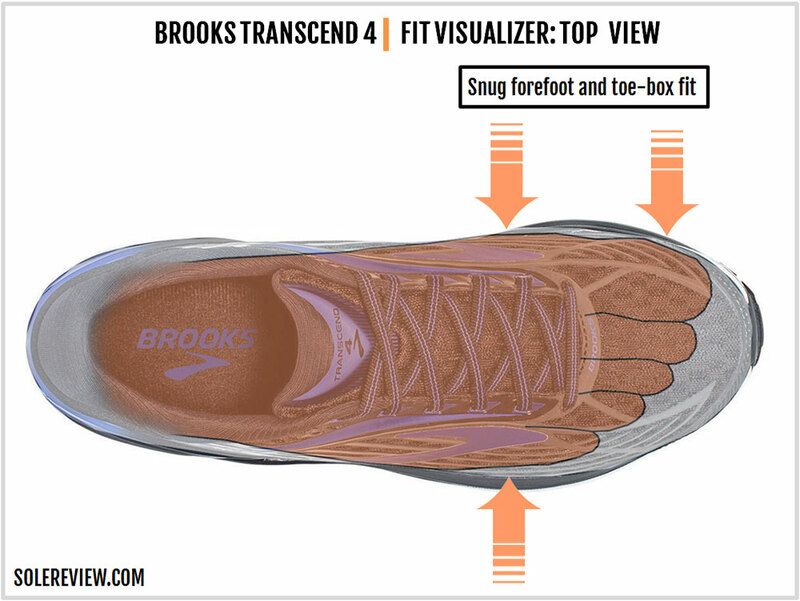 The Transcend 4’s simpler upper mesh design would have ideally resulted in a wider forefoot and a higher toe-bumper. But as the heel pushes the foot footwear, most won’t notice the difference. An extra flex groove is what the outsole gets, resulting in greater flexibility than all the Transcend iterations so far. There’s no weight difference between the T3 and T4, but the price goes down – by a princely sum of $10 on the full retail price. 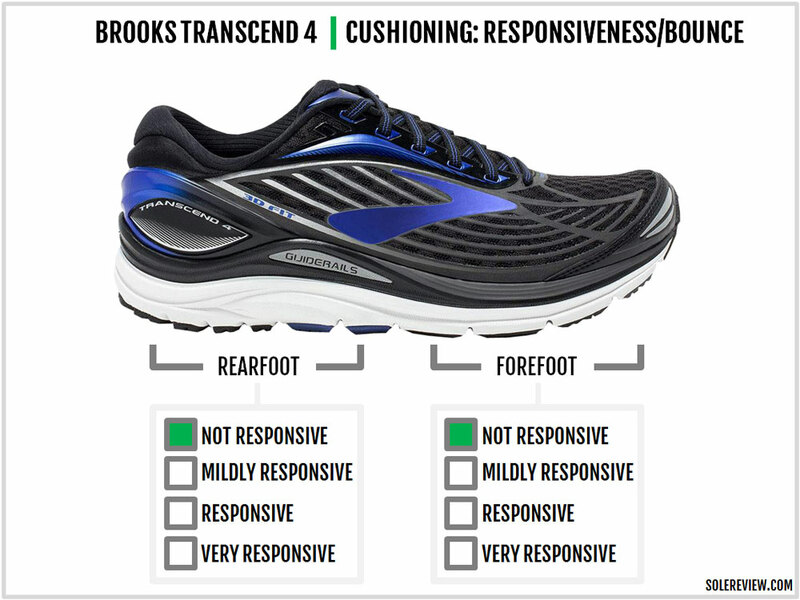 This rotational recommendation for Brooks might appear unusual because of the Ghost 9. But there’s a reason why we suggested the Ghost 9 instead of the Adrenaline GTS 17 or the Ravenna 8. If you look past the Transcend’s ‘support’ or ‘stability’ categorization, then the shoe is just a neutral cushioned shoe with a lot of support. 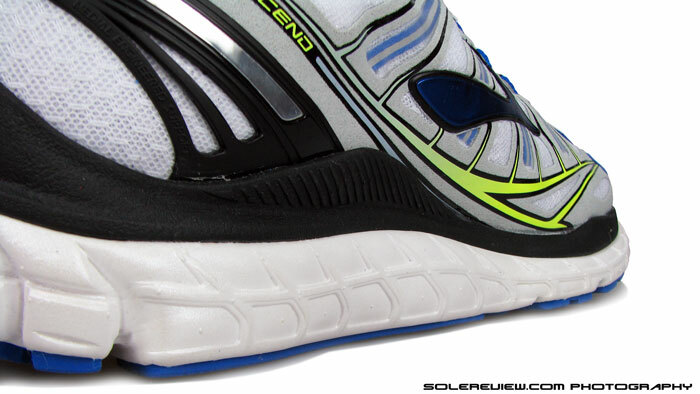 Unlike the Adrenaline or the Ravenna, the Transcend lacks a medial post. In that spirit, the Ghost 9 is an ideal add to the mix. It is cushioned but in a firm way which makes it supportive. It might not have the Guide Rail, but the upper midsole has a firmer rim which adds to the supportive quality of the Ghost 9. As for race-day use, the Hyperion works best for shorter distances, and up to a half marathon if you’re ok with the cushioning level of minimal racers. 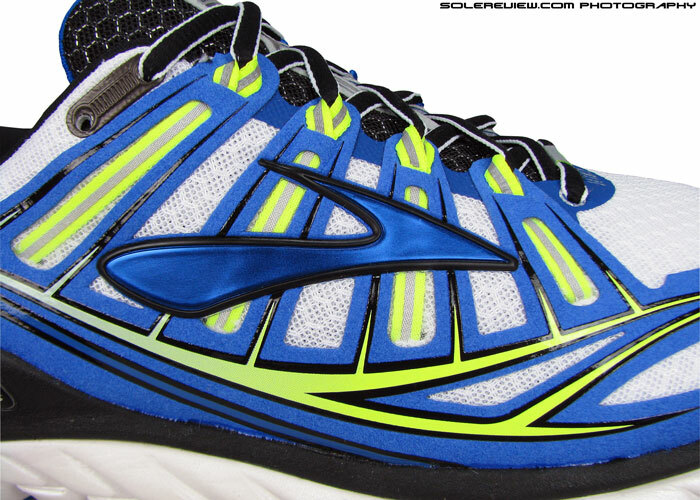 The Saucony Guide 10 is not comparable with the Brooks Ghost 9, but it does have a very balanced ride. The cushioning is firm, but there’s a tinge of responsiveness – thanks to the Everun topsole under the insole. But if you can wait for a month or two, then you should consider the adidas Supernova ST (replacement for the Sequence 9) instead of the Guide 10. With its medial-post free Boost midsole, the Supernova ST will be the perfect companion to the Transcend. And for faster runs and race use, we recommend the adidas Boston 6 Boost. Read our full review to know more about this excellent shoe. Because of its distinct design, there are no direct competitors to the Transcend in form or function. 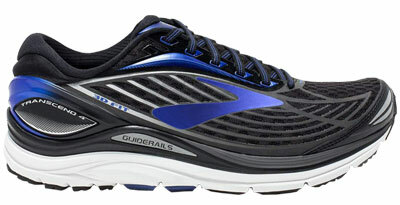 The nearest neighbor would be Brook’s own Glycerin 14, a neutral running shoe which has a similar ride quality. The Glycerin has neither the Guide Rails nor the wide outsole, but the SuperDNA foam midsole feels a familiar place when coming from the Transcend. At some level, the adidas Ultra Boost ST is comparable. It is very well cushioned and eschews the use of a medial post. Though the UB ST has a wide outsole like the Transcend, the abundance of bouncy Boost foam does not make it as supportive as the Transcend. The Ultra Boost’s upper fits a lot roomier than the Transcend too. We’re curious to know how the upcoming adidas Supernova ST will ride; given its lower place in the support category, it should end up being closer to the Transcend than the UB ST. There are other shoes in the support category, but most of them include a harder medial post. The New Balance 1260 V6 is similar to the Transcend in positioning; it combines cushioning and support without excessive heel bias. The Kayano 23 is Asics’s veteran cushioned motion-control shoe, and the Hurricane ISO 3 does the same thing for Saucony. Besides the Transcend and the Ultra Boost ST, the Mizuno Wave Paradox 3 is another shoe which does not use a medial midsole wedge. But it runs much firmer than both shoes, the result of a hard plastic ‘Wave’ plate sandwiched between the foam layers.